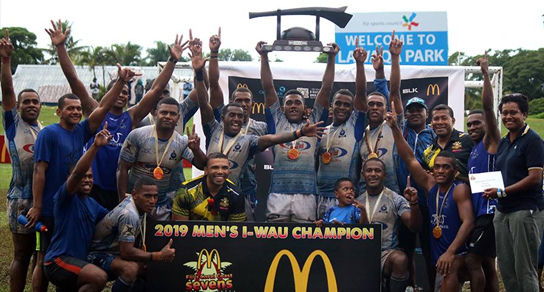 Police have successfully defended their title defeating the Tabadamu 7s team 17-0 in the final of the McDonald’s Fiji Coral Coast 7s this afternoon. Necani Waqadau, Filipe Sauturaga and player of the tournament, Rusiate Matai scored for Police. Police dominated possession through out the game. The game got very heated towards the end of the game with players from both teams receiving yellow cards. Tabadamu received 3 yellow cards which was to Samu Bale, Semisi Taseve and Atanasio Murimuri while Police received 2 yellow cards to Rusiate Matai and Livai Ikanikoda. Police Captain Livai Ikanikoda says they have been preparing for a long time for this tournament and that the weather they played in today was the same as the weather they trained in everyday for the past two weeks. Police received $10,000 as prize money while Tabadamu received $2,500 as runner ups.